It's that time of year again. The holiday season is kicking into full throttle. If you are like me you are spending a significant amount of time these days thinking about holiday menus, making shopping lists and planning your holiday preparation. 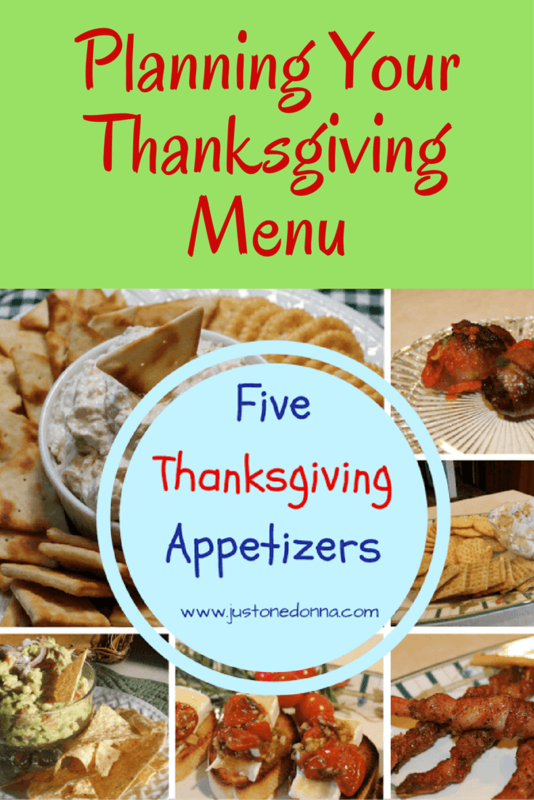 Have you decided what appetizers you will serve this Thanksgiving? If not, I've assembled some suggestions from you. 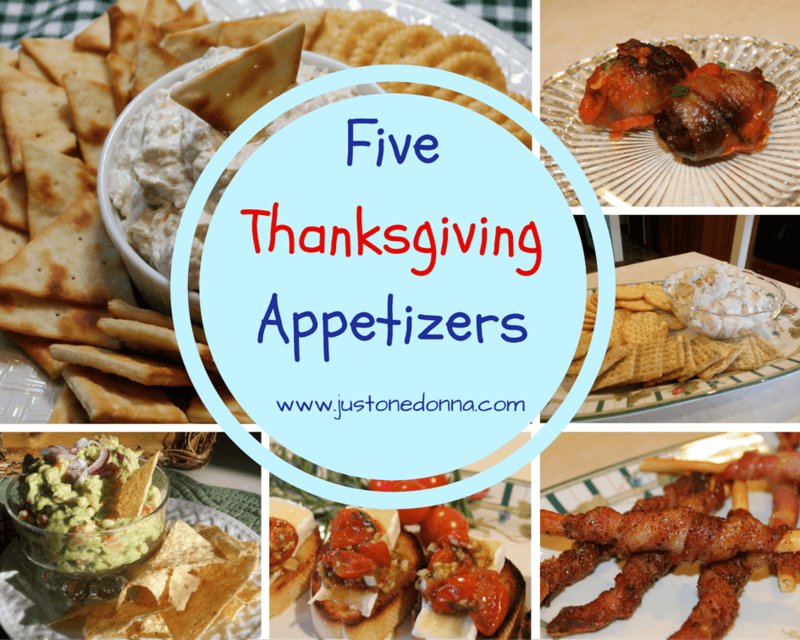 This is a list of five of my favorite appetizers. They are tried and true party pleasers. Choose the one or two that best represent the flavor preferences of your family and you can't go wrong. Do you want to surprise your guests? These jazzed up, sweet and spicy bacon wrapped breadsticks are sure to delight. They are easy to assemble and cook quickly in your oven. Serve these bacon wrapped breadsticks warm or at room temperature. This roasted tomato and brie bruschetta is always a crowd pleaser at Just One Donna gatherings. What's not to like about these tasty, two-bite personal pizzas? Make both the tomato topping and the toast rounds in advance. Then all you will have to do is assemble and heat for your party. Caramelized onion dip may seem passé, but you would never know it when you see how fast this dip disappears at every party. You can make this dip several days in advance. The dip actually intensifies the flavors when you do. Just take your time in caramelizing the onions. You want a deep, rich color that comes from patiently cooking the onions for about 45 minutes. Double the recipe and freeze the extra to have on hand. You'll be glad you did. Are you looking for an appetizer that is a little different? This one will do it. The sweet and savory combination of these tasty, Chorizo stuffed little morsels will keep your guests coming back for more. The roasted pepper sauce takes a little time to make but is definitely worth the effort. Please don't skip the sauce. Finally, if you will be watching football games all afternoon you'll want an old standby, guacamole. This is my favorite guacamole recipe. Do you like yours packed with heat? Just add more jalapeno pepper and hot sauce. 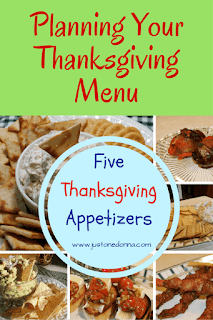 You'll find an inspiring collection of Thanksgiving appetizers and cocktails in my Thanksgiving Appetizers and Drinks Board. Check it out for more festive suggestions I think you'll like.